Dr, Abiy Ahmed was in the country last weekend as a special guest for the celebration of our Heroes day. He is the Prime Minister of the Republic of Ethiopia, and replaced Hailemariam Desalegn about a month ago. Ahmed arrived in the country on Friday, and from our sources, we learn that he was treated to a red carpet welcome and accorded a 19-gun salute. He also managed to inspect a guard of honor mounted by the Officers and men of the UPDF and was received with a range of Ugandan Traditional Dances. During the weekend, he held various discussions with president Yoweri Kaguta Museveni at State House. Ahmed was honored in various ways, one of them is being awarded the highest accolade; The Pearl of Africa grand master medal at the celebration of the International Heroes day. 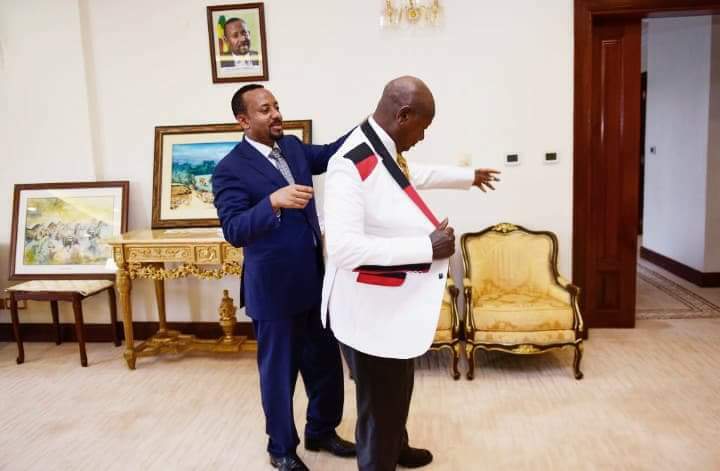 Before he left the country, they shared gifts with the president, one of them being a designer jacket. 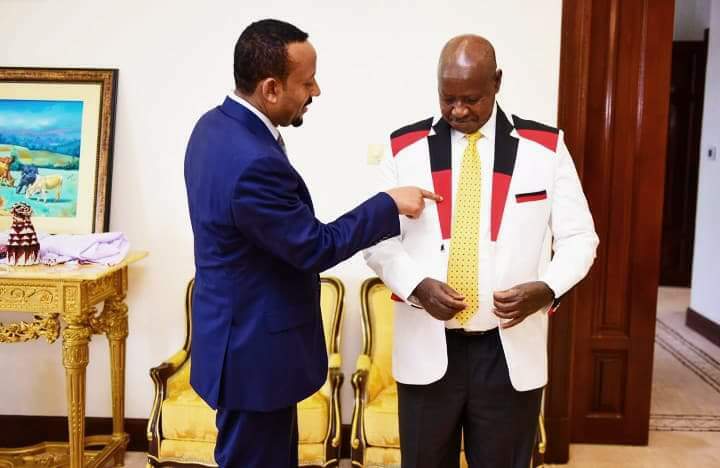 “Before his departure from Uganda, Ethiopian Prime Minister Abiy Ahmed Ali and I exchanged gifts at State House Entebbe. I thank him for the colorful jacket. I also thank him for honoring my invitation and our countries will continue to strengthen our political-economic ties.” the president posted.